The Dell Inspiron 3542 Laptop features cutting edge technologies and packs all the essentials you need to increase your daily productivity. Lightweight and durable, the ergonomic design of this Dell Inspiron 15 laptop provides a pleasant laptop computing experience on the go. The 3rd generation, Intel Celeron N3060 processor fueling the performance of this Inspiron 15 Dell laptop runs some of the most demanding apps without breaking a sweat. TheAirmont architecture of the CPU allows it to unleash a powerful processing performance while keeping the energy consumption to its minimum. The built in, Intel HD 400 graphics adapter handles all the visual processing and enhances the overall performance of the system. The 4GB RAM module offers a seamless multitasking session. The 500GB HDD that comes integrated into this Dell Dual Core laptop offers ample storage for all your data needs. Available in an elegant black finish, this Dell Inspiron laptop comes with Free Dos but you can purchase Windows 10 operating system from Saruk Digital that is renowned for its user friendly interface. The laptop is entirely built out of plastic but with a different finish. It’s relatively light (2.1kg) for a budget model and pretty thin (21.7 mm) so it can easily compete against other alternatives on the market. 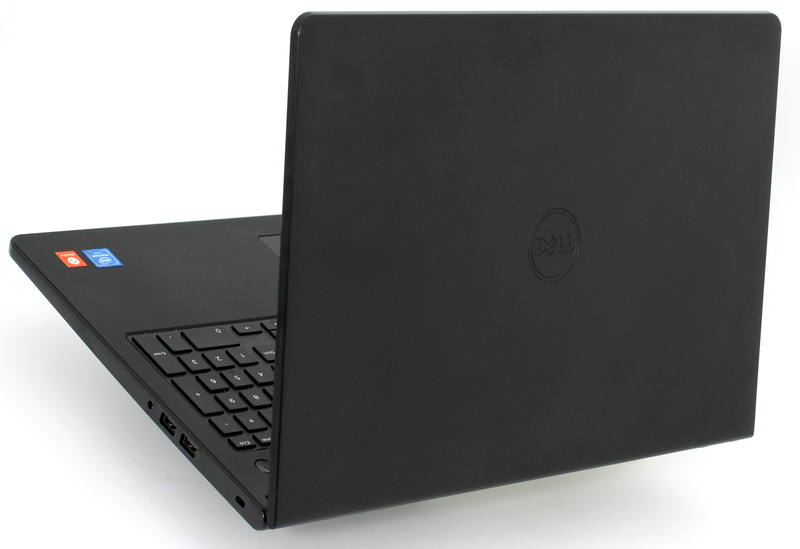 Typically for Dell, the Inspiron 3552 looks pretty strict and minimalistic without many design features. The lid features textured black plastic with Dell’s logo in the middle and also bends a little bit too much under pressure, but that’s quite common for this price range. The bottom holds a big service lid that gives easy access to the HDD, the single RAM slot and the Wi-Fi module. The 15.6inch display produces awe inspiring visuals and 1366 x 768p rendition offers superior visual clarity. The integrated speakers, backed by the award winning Waves MaxxAudio technology, deliver stunning audio quality. The loudspeakers provide excellent clarity in high frequencies and the crisp sound in the mid and lows. The 3rd generation, Intel Celeron processor runs some of the most demanding apps without breaking a sweat. The built in, Intel HD 400 graphics adapter ensures system stays ultra responsive by handling all the visual processing and lets you play HD media without any stutter. The 4GB RAM module offers seamless multitasking and 500GB HDD offers sufficient storage for all your data needs. Four cell, 40WHr battery provides up to 8 hours of extended uptime. This Inspiron has USB v2.0 and v3.0 ports which lets you connect compliant external devices to the system and share data at blazing fast speed. Connect with friends and family using the built in webcam. A built in card reader lets you quickly access content stored in supported memory cards. WiFi connectivityallows you connect to the Internet wirelessly using public as well as private hotspots. Bluetooth support lets you pair the system with similarly enabled devices and share audio and data wirelessly. An integrated GPU used in all CPUs part of the Braswell generation. The GPUs frequency can vary a lot – from around 300MHz to up to 700MHz, depending on the model of the processor. It has 16 EUs (Execution Units) and its architecture is almost the same as the one on the Core M CPUs (while the Core M’s graphics integrate 24 EUs). The GPU can support up to 3 displays with a maximum resolution of 4K, but internally can handle only 2560 x 1440 (QHD) via eDP. The external displays can be connected via HDMI or Display Port. Other major features include the support of DirectX 12 and Open GL 4.2. Order the Dell Inspiron 3542 today and have it delivered to your doorstep within 1-3 working days or same day delivery within Nairobi. Payment on delivery.